I splurged on this little bunch of sunshine at the grocery store this week. I don't know about your house but my house always looks a little sad when the Christmas decorations come down. 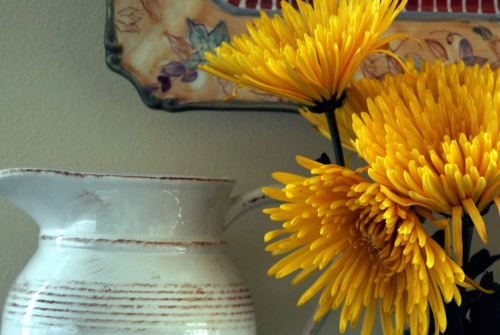 I thought this little bouquet would do the trick in adding a little sunshine to my post holiday decor. Tucked into a blue canning jar, it's the perfect cure to those post holiday blues. One more thing to add to my list of must do's this year. Splurge on fresh flowers more! Definitely worth every penny. I hope you have a sunshine filled weekend, no matter what the weatherman forecasts. I'll be back tomorrow to share my New Years hopes and dreams list with you. Wow, spider mums you will get a long time out of them. Great way to spend your money. They will last for weeks. Very pretty!!! Oh I love your sunshine in a jar!! I adore fresh flowers too!! it is amazing how much joy a small bunch of flowers can bring. In the winter I frequently do that before mine start blooming. 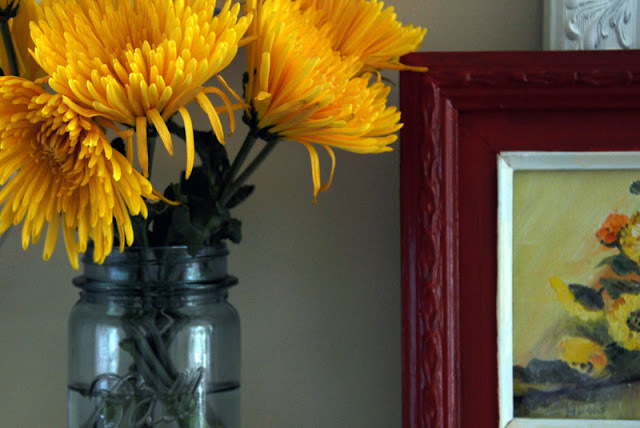 The flowers look so cheery, and the look good next to the floral picture too! It's gonna be a long winter, I think I may buy some flowers today, myself! What a pretty little burst of color! And yellow is so sunny! I like to splurge for fresh flowers this time of year when my garden isn't producing much. Such a simple way to add some cheer. Your yellow flowers looks so pretty and cheery. I really need to do that more often for myself this time of year. Looking forward to your list of Hopes and Dreams for the New Year. I'm definately due for a splurge! Gorgeous! Those are so pretty and don't even look real. Is that the little jar we all bought one of? I am so happy to have Christmas put away and done as we have a busy weekend. My daughter turns 14 today and a New Years party to attend and family over for b-day on Sunday but the one thing I miss is my tree. We still have outside lights up so I can see some twinkling lights. You are so sweet to offer to teach me some sort of creative thing. I would love to learn to crochet as that doesn't have to many parts and my mom used to do it. Hello there! Thanks for visiting my blog and leaving your sweet comment. Love the flowers! I think I'll get me some too...I rarely ever do that, but it always makes me happy. I, personally, think your house is always cheerful looking. but I think when you see something everyday it looks different than it does through someone elses eyes! And why not spoil yourself? Happy New Year-I've enjoyed my visits! I love a bunch of fresh flowers from the grocery store...they always make me smile...yours look wonderful! Happy New Year!! What a great idea to buy some fresh flowers! Outside, it smells like Spring. It was 60 degrees and absolutely beautiful today. I opened the windows and even though it got alittle chilly, the air smelled so good. Just think of how much better that air would of been with the smell of flowers with it. Today was such a nice blessing. I have been ready for Spring again, so I did get a little taste of it! I do think that I will buy some fresh flowers during the next couple of months. Thank you for the idea! Your sunshine in a jar is wonderful! You have inspired me- I'll be looking for a bouquet to bring home too! Your flowers are such a burst of joyful colour. Tomorrow, I put away the Christmas decorations and place the needle-dropping tree outside. I'll miss it. yeah, its always a sad time when the Christmas decorations come down. 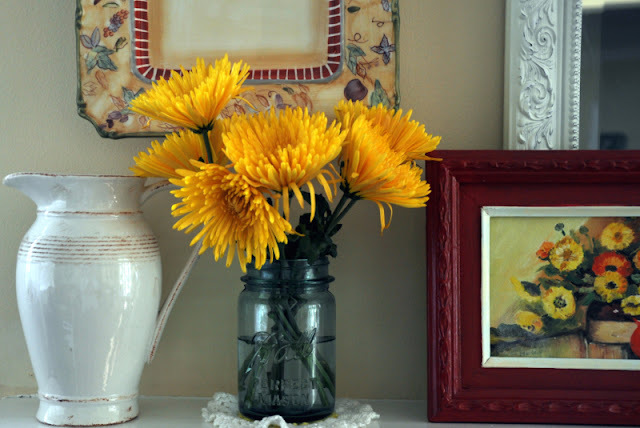 I like your flowers and jar though- so uplifting!! Happy New Year!! Wishing you a happy New Year 2012! I like to leave up my faux berry garlands and such and then add my snowman type decorations to keep the place from looking so drab. They stay up until I'm ready to decorate for spring. :) I'll do a post about it later this week.